An independent video and written blog covering wines, beers and liquors from all over the world. Up to the minute wine news, interviews and updates. A look inside the wineries from the eyes of winemakers, tasting room staff & wine colleagues alike. Enjoy our wine reports. Drop us a comment and let us know what wineries you would like to see on Parallel Winos. I guess we can start with the geocache this time, because I'll be honest with you, the cider was interesting at best. GC2P5MY: NRV A Guardrail Cache. So apparently this is an easy guardrail cache to find. The hint says magnetic and it was found about 20 times in late September during the quarterly cache machine. Of course, the only person who didn't find it was TravisL, the organizer to the cache machine. LOL. I find this ironic. I still have not found this cache, but I'm looking forward to getting my hands dirty by sticking them in the nooks and crannies of this barrier. We'll see how difficult it's 4 star rating really is. The Cache location is surrounded by apple orchards and in the Yakima area. This is the connection to the cider I will review next. closer to home. A Washington apple cider, because what is Washington known for other than Starbucks and Microsoft? Apples. 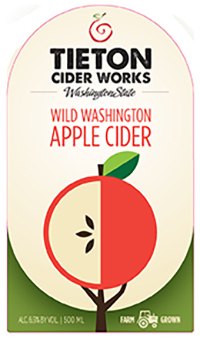 Tieton Cider Works has been around for several years and it just recently went through a well deserved packaging redesign that shot it straight into the 21st century. I'll be honest, the old label was retro 1988 or so. Winemaker, corporate liquor buyer; creator of The Underground Winos. The Parallel Winos. 20 yrs in the wine industry. Entrepreneur, creator, networking genius. Video Web-media, social networking.